Facebook “likes” and Twitter followers are great. But you know what the really smart business owners are paying attention to? Online reviews. 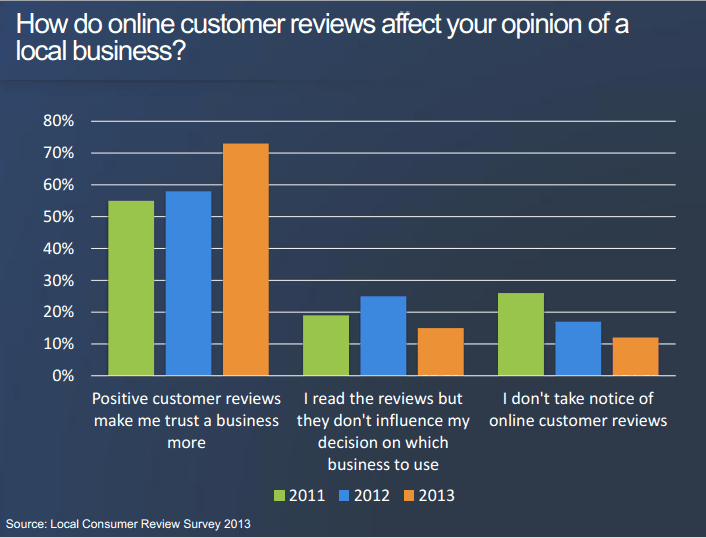 It’s no secret that reviews make a direct impact on business performance. Bad reviews keep people out and good ones bring people in. To show just how much reviews – on sites like Yelp, TripAdvisor, OpenTable, Google, Foursquare, what-have-you – are influencing consumer behavior, the results of the new 2013 Local Consumer Review Survey have been released, serving as a call to integrate review management with business strategies. 67 percent of consumers read 6 reviews or less before they feel that they can trust the local business. Meanwhile, only 22 percent read more than 7 reviews – down from 35 percent in last year’s survey. 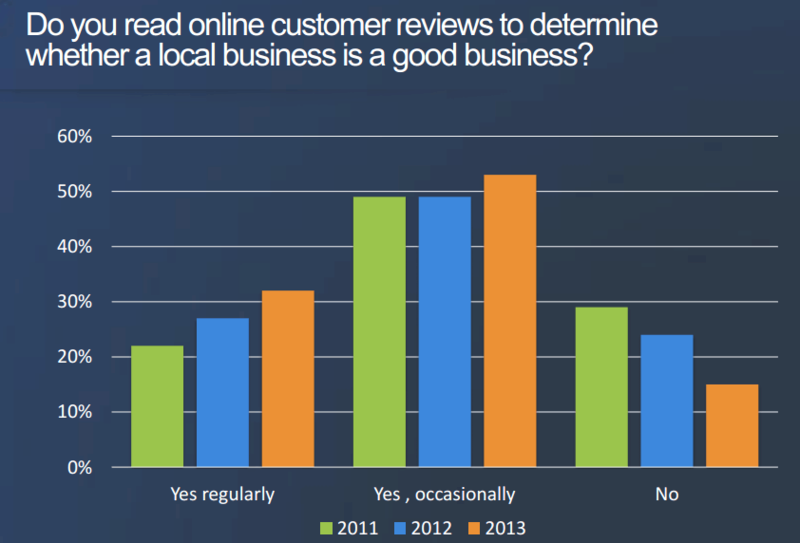 73 percent say that high ratings and positive online reviews make them trust a local business more, while only 12 percent said that they take no notice of online reviews. Asked if they trust online customer reviews as much as personal recommendations (from friends and family), 79 percent of the respondents said that reviews were as trustworthy as personal recommendations. The analysis also showed that lifestyle businesses like restaurants (67 percent), general shops (35 percent), clothes shops (28 percent), and hotels/accommodations (30 percent) attract the most searches by consumers. Consumers also like to track online reviews of doctors and dentists: another sign that more people are using the Internet to find health information and doctor and medical reviews. “The findings of the 2013 survey provide further, unequivocal evidence of the growing influence which online reviews have on consumer attitudes and purchasing habits of local business services…. A business’s reputation is more public and more accessible than ever before,” wrote Sophie Kemp. Click here for the complete report. You can also check out the graphics below for more highlights and information. These are some really interesting facts. I wonder what does the survey say about the current year? Has trend changed?